Providing you the best range of decorated diya, clay diya lamp, fancy clay diya and t-light candle holder with effective & timely delivery. 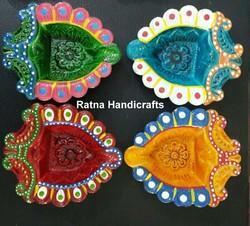 Hand painted decorated diya for all occasions. The piece can be used for puja purpose and other occasions. Handmade and Hand Painted Decorated Diya for decoration and all events. We provide huge range in vibrant colors and designs. 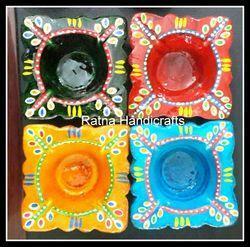 Hand painted and Hand decorated diwali diya with colorful and variety range. The decorated and range is usable for all events and decoration at all times. Traditional Indian Clay Lamp/ Diya for Diwali and other decoration at home and temple. The Clay lamp in exlusive designs and hand painted with vibrant colors. 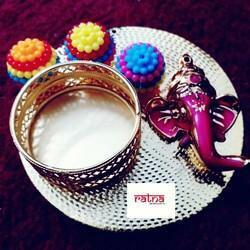 Since our inception, we are instrumental in offering premium quality Fancy Diya. The offered decorative diya is designed with precision by using finest grade of material by vendor’s renowned craftsmen. 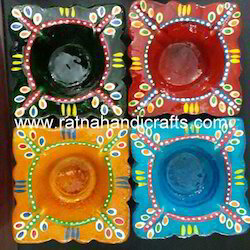 Our decorative diya is available in various beautiful designs and patterns as per the needs of customers. 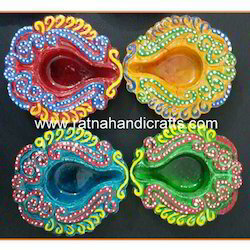 Additionally, our customers can avail this decorative diya at most competitive price. 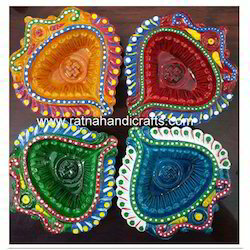 Flower platters for diya and tea light decorations to make your festivals look beautiful. . You can visit ratna handicrafts.com for more products.